Sushi anyone? With a side of wasabi? 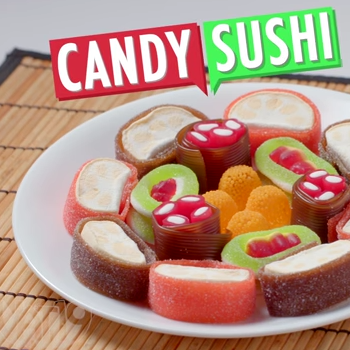 Whether you like sushi or not you are sure to love this sushi - Candy Sushi! Sour belts, marshmallows, licorice, and sour rings make up the sushi - sour, sweet, chewy and definitely not fishy. 2 Candy Koikuchi (two flavors of licorice strings). Use of chopsticks...optional, but not included. Includes 19 pieces of candy sushi and 2 "dipping sauces". My grandkids was happy to receive this candy. They also said it tasted great. They loves it..Look real at first..